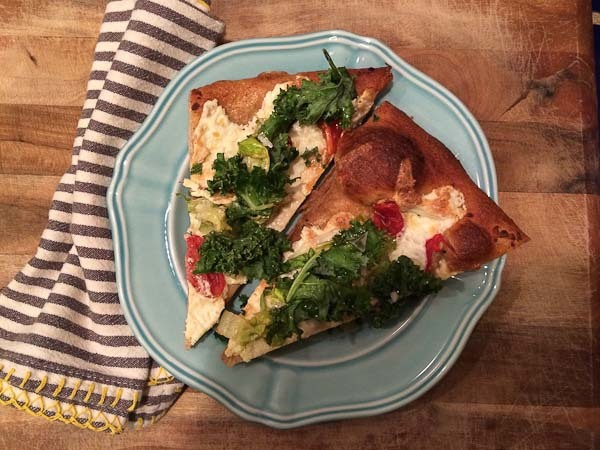 I’ve posted a few WIAW “What I ate Wednesday” blogs on here in the past and you all seemed to really like them, so I figured I’d start a series of our weekly eats and workouts keep me on track with cooking at home more, accountable to my fitness routine, and to hopefully help to inspire you with ideas to answer the question, “what’s for dinner?”. 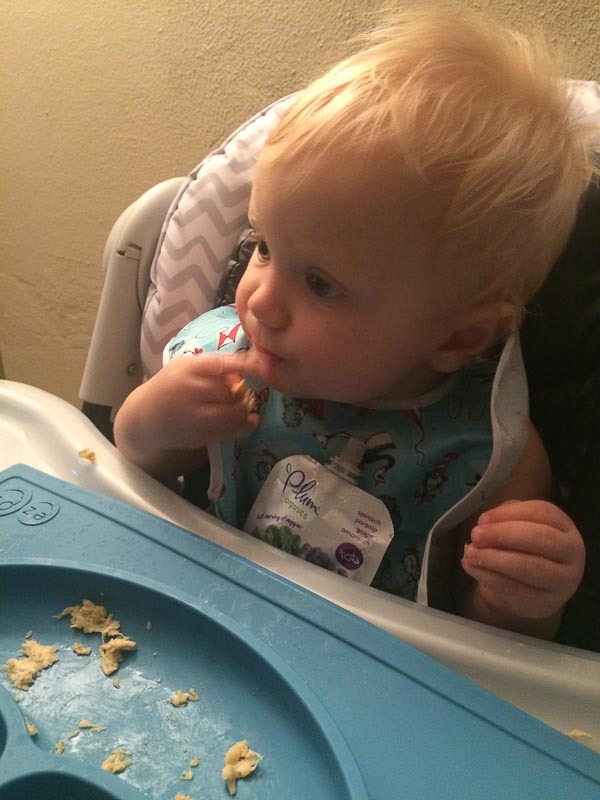 With Parker starting to eat more than just purees and knowing how important the family meal is, we want to establish a healthy routine for him of eating together as a family. Last week was a short week for us since we were on vacation at the beach. But here’s a look at our meals and workouts. Wednesday: Chicken Enchiladas with Mango Slaw. This meal was so good! I had some leftover shredded chicken in the freezer, and I added them to corn tortillas and topped with enchilada sauce and cheese. + Fresh mango, cabbage, onions, and jalapeños into quick slaw. 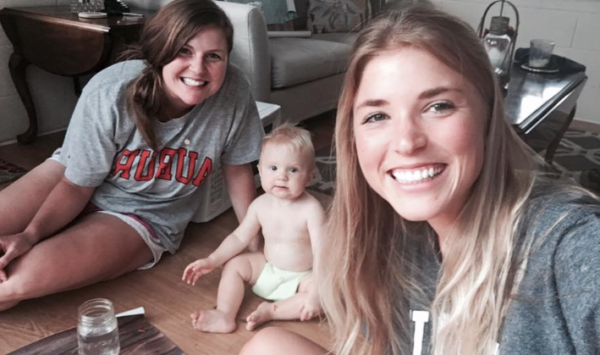 I didn’t have much time this night to cook so I laid everything out before Body Pump class and scooted off while Eric took Parker on a run. I zipped back to the house and had dinner ready in about 20 minutes. 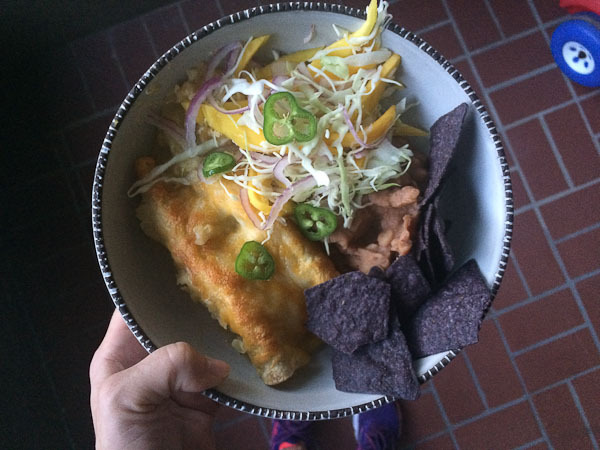 Enchiladas make weeknight eating easier! If you haven’t already, check out my resource for 10 ways to use simple shredded chicken for easy weeknight meal prep. This was Parker’s first real meal (sans Jalapeños, slaw, and chips). He gobbled it all up and ate two plates of shredded enchiladas + a veggie squeeze… see it in his bib pocket there? 🙂 He cracks me up. Have you tried bean pasta? This was my second attempt at bean pasta and while this one was actually pretty flavorless, I just can’t get past the smell of the pasta cooking. So it kinda turned me off before the meal even started. 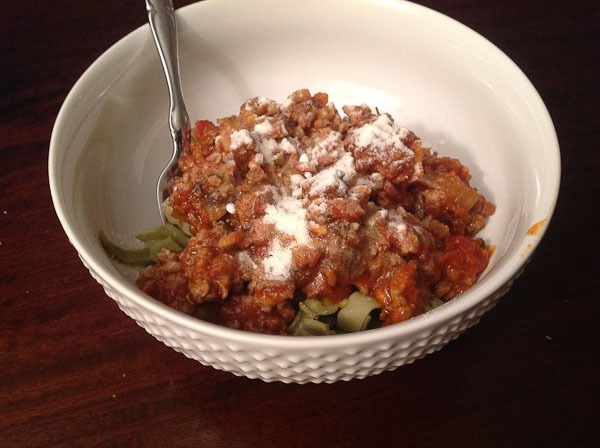 I love spaghetti and if you’re really looking for ways to up the protein (this spaghetti has 18g protein per cup), then it may be for you, but if you want really good tasting and smelling spaghetti… stick to the regular stuff. We had a pizza party on the floor with my intern, Jackie. More like a photo shoot for a client (recipe to come, get excited), that ended with let’s eat. all. the. pizza. It was Parker’s idea because he went in for the kale first. We had a birthday party for one of Parker’s friends on Saturday and decided to make a date out of it and hit up a new restaurant in town. 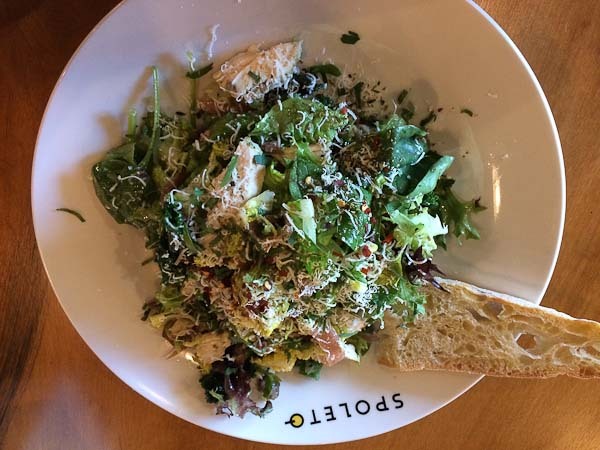 It was pretty good, but the salads were kinda pricy. Well that’s the week. It was a short one since we were at the beach for half of it 🙂 On the fitness front, I did a lot of beach walking on our vacation. I’ll see you back here next week for another look at our week of eats and fitness. Let me know if you like these posts by hitting reply or leaving a comment below!